Review today Today Weather weather Today Weather is a beautifully crafted application which is AMOLED friendly! 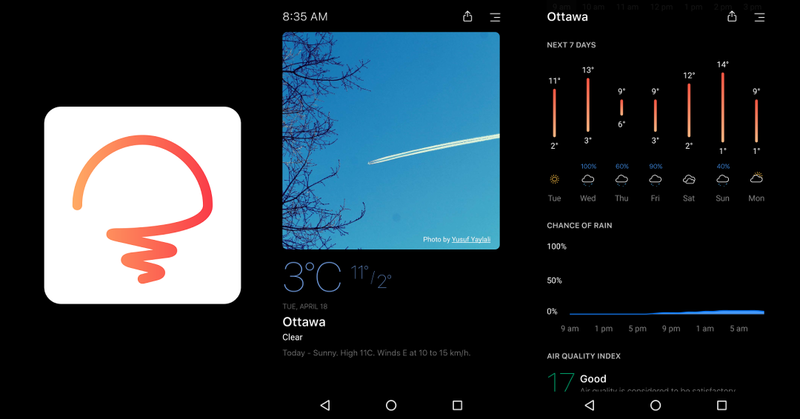 There are so many choices in the Google Play store when it comes to weather apps. They all have pro’s and con’s to each one of them and often enough it will come down to a preference on which one we like. Today Weather brings a modern approach and an easy to understand weather model. It’s a refreshing dark UI which is very pleasing and easy to get around. Let’s watch this little video introduction and I’ll continue on with my review of this exquisite application. The first thing that jumps at me is how friendly the application is to AMOLED displays. The balance between the colours pallet and the dark aspect of the background allows for a very nice blending of the overall look. You’ll get all the information at your fingertips and in an easy to understand the model that allows you to scroll to see the temperature by the time of day. This is followed by a forecast model of the next 7 days to better prepare yourself for the week. As we all know, forecasts are a prediction of what could potentially be and not an accurate science.